December 2, 2011  The highly anticipated news brought a surprise: The unemployment rate had been expected to stay at 9 percent. But it fell in part because of an increase in the number of "discouraged" workers. They've given up looking for jobs. November 10, 2011  The two indicators suggest modest economic growth, but experts don't think they're big enough to signal sustained economic growth. The numbers, however, will serve to further ease fears about a double dip recession. November 4, 2011  The general consensus among economists is that there were about 95,000 jobs added to payrolls in October and that the unemployment rate stayed at 9.1 percent. While "frustratingly slow," that could be another sign the economy is on the mend. 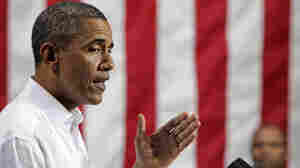 October 24, 2011  With his jobs package stalled in Congress, the president is going to announce some executive actions on mortgages and student loans that his advisers say could give the economy a lift. Republicans say "we can't wait" to defeat the president. 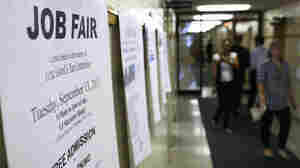 Job seekers waited in line to meet with recruiters at a job fair in Park Ridge, Ill., last month. October 11, 2011  The $447 billion plan is likely to be rejected later today when the Senate holds a key procedural vote. Democrats have a "Plan B," though. They're looking at breaking up the measure into smaller pieces that may stand better chances of passage. September 15, 2011  In an address this afternoon, the Republican lawmaker makes the case for lowering the corporate tax rate and closing loopholes. September 12, 2011  The president criticizes an unnamed GOP aide for saying Republicans don't want to cooperate on a jobs plan because it would be bad politics for the GOP. He doesn't note that some Republicans, including that aide, also say the plan won't work. September 12, 2011  With the solemn ceremonies marking the 10th anniversary of the Sept. 11 attacksnow over, Washington returns to the subject most likely to dominate the political debate between now and the 2012 presidential election: Jobs and the ailing economy. September 9, 2011  The Treasury secretary makes the case for the plan. But some top Republicans say the latest proposal from the administration wouldn't boost job growth. September 8, 2011  With the nation facing the specter of a renewed recession and Washington virtually paralyzed by partisan gridlock, President Obama sought to pressure GOP lawmakers in his speech to a joint session of Congress. 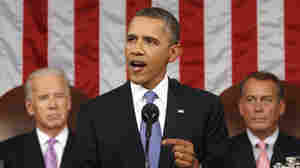 He dared the Republican-led House to block his proposals for a new stimulus of targeted tax cuts and spending. September 8, 2011  The president says there is "nothing controversial" in his latest jobs program. It's time, he says, to "actually do something to help the economy." And he's laying out a plan he says has bipartisan appeal. September 8, 2011  National Journal provides more evidence of the long odds President Obama faces in trying to get his jobs proposals through Congress. Many inside the Beltway Republicans polled by the news outlet say jobs legislation just isn't a priority for them. September 8, 2011  When making the case for his job policies, the president talks a lot about worker retraining, infrastructure spending, innovation and exports. His guests offer some real-world examples for Obama to cite. 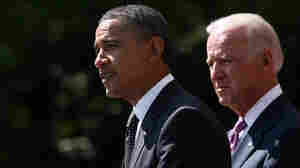 September 8, 2011  The key elements of President Obama's jobs plan have been widely known for days. The package, with an estimated cost of $300 billion, will feature proposed spending on infrastructure projects, an extension of the payroll tax holiday and tax cuts for employers who hire new workers. All of which sounds like what the Lawrence Summers, formerly Obama's top economist, recommends. 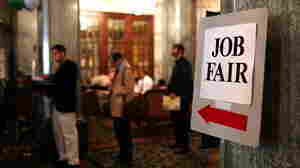 September 8, 2011  In the first hour of Talk of the Nation, employers talk about what would make them start hiring again. In the second hour, the future of the NFL, and the TOTN freshman reads series continues with author Jared Diamond.